We love tassels, they are everywhere at the moment! 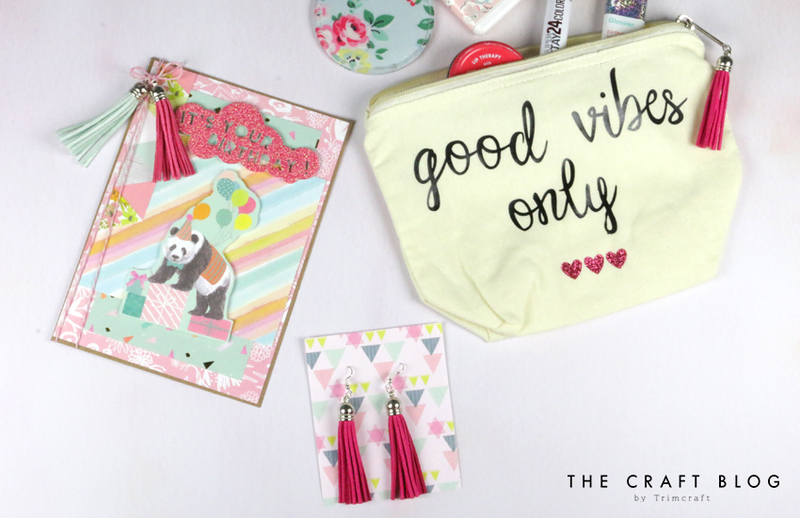 There’s no limit to what you can do with this trendy embellishment, so in today’s ‘One Item 3 Ways…’ we’re showing you some innovative ways to craft with the Dovecraft tassels! Maxine is going to show you how to use the Dovecraft tassels to transform a makeup bag, how to create a pair of stylish earrings, and how to add a fun finishing touch to a celebration card! 1. Choose your design on the Cricut Design Space or create your own design using the software. Remember to reverse any text that you are using in your design so that it cuts out the right way round. 2. Weed the design onto the vinyl ready to use and place the design onto the bag where you want it to be. 3. Heat up your EasyPress (or iron) and place the EasyPress over your design. Follow the instructions on the EasyPress depending on the vinyl and fabric that you’re using. If your design has separate pieces, iron each piece separately. 4. Remove the back from the vinyl, carefully checking that the design has adhered. 5. Take your Dovecraft tassel, and, using a small metal ring, attach the tassel to the zipper. Your bag is now complete! Why not customise with your initial, or one of your favourite quotes? We also created a pair of cute earrings with a set of Dovecraft tassels! The perfect way to accessorise, these will make any outfit pop. So easy to create, all you need is a set of fish hook wires, a pair of Dovecraft tassels, and a small metal hoop to attach them both together! Totally transform a handmade card with tassels! We used the Let’s Celebrate papers from First Edition to create this fun card, and then added extra dimension with two tassels, tied with coloured twine! We are sure that there are so many ways to incorporate tassels in crafting, what other projects have you created using them? Will you be creating your own versions of these tassel projects? We’d LOVE to see so don’t forget to #Trimcraft when uploading to social media and to share your makes in the Inspiration area.